You can also display a list of the most recent blog posts to your site. For more information, see Recent blog posts gadget. You can embed a Wild Apricot blog on another website using widgets. You cannot add a blog gadget – or any other singular gadget – to a page template or system page, or to a page containing another singular gadget. Go to Sites pages (under the Website menu) and create or begin editing the site page where you want the blog to appear. Click the Gadget icon to display the list of available gadgets. Drag the blog gadget from the list, and drop it where you want it to appear on the page. You can insert it into a section within a layout, or above or below a layout. When a layout cell or placeholder is empty, a Drop gadget or grid here prompt will be displayed. When you drag a gadget over an empty layout cell or placeholder, it turns green, indicating that you can drop the gadget there. When you drag a gadget above or below a layout, a prompt will appear indicating that you can drop the gadget before or after the layout. From the gadget settings panel on the left, choose the desired settings for your blog. You can choose the blog name, control whether an RSS icon appears, and decide what kinds of visitors can read, comment on, and add blog posts. For more information, see Blog gadget settings (below). Now that you have added a blog gadget to a site page, you can adjust the blog gadget settings to control the appearance of the page and the ability of visitors to read, add, and comment on posts. Gadget settings appear in a panel on the left side (which can be hidden to maximize the page design area). To display the settings panel, you position your pointer over the gadget – while editing a site page – then click the gadget settings icon. The following blog gadget settings are available. Choose the name used to identify the blog within the settings for the recent blog posts gadget. Decide whether to display an RSS icon appears on your blog beside the blog title. By clicking on the RSS icon, visitors to your site can subscribe and be automatically notified of updates to the blog in their RSS reader. If your blog appears on a page with restricted access, the RSS feed will not be accessible to your RSS reader. If you're using Google Chrome, you may need to add a RSS subscription extension to your browser. Choose whether to display the complete content for each blog post, or just a short excerpt from each post. Below each excerpt would be a Read more link that the reader can click to view the full blog post. Alternatively, the reader could click the topic title. For each type of visitor to your site, you can control whether they can read, comment on, or add posts. You can set access permissions separately for public visitors, and for each membership level and member group. If you restrict permissions by both membership levels and member groups, then members will be granted the highest permission assigned to the levels and groups they belong to . For example, if you provide read-only access for Bronze members but full access to members of the Steering Committee member group, then a Bronze member who is also a member of the Steering Committee will be granted full access. Read: Can read posts, but cannot comment on or add posts. Read, comment: Can read posts and comment on them, but cannot add new posts. Read, comment, add posts: Can read posts, comment on them, and add new posts. Public visitors (non-members) can never create new posts. 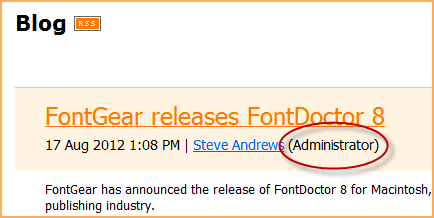 Administrators in admin view can always view and comment on posts, and add new posts (and modify and delete any post). In public view, administrators are subject to the same restrictions as others at the same membership level. Here, designers and developers familiar with HTML and CSS can enter CSS code or classes to further control the appearance and behavior of the gadget. You can add a description for your blog by inserting a content gadget ahead of the blog gadget. Within the content gadget, you can add a title and description, and format them using text styles.For more information on adding and formatting text, see Using the content editor. To prevent automated software – known as spambots – from bombarding your blog with spam posts and comments, you can enable Wild Apricot's anti-spam Captchafeature. With Captcha enabled, visitors to your blog would have to enter a set of characters – proving them to be a person rather than a program – before being able to add a post or comment. 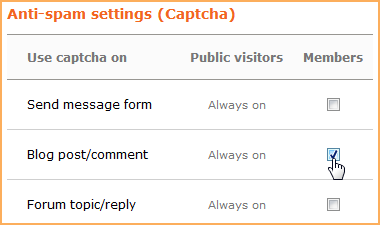 To enable Captcha for blog posts and comments, go to Settings, and click Anti-spam settings (Captcha) under Security. On the screen that appears, click the checkbox beside Blog post/comment then click Save changes. Some spambots can use OCR technology to bypass Captchas, so you might consider restricting blog comments to logged in members. If you continue to receive a lot of spam, contact us and we'll try to identify and (at least temporarily) block the spammer's IP address. 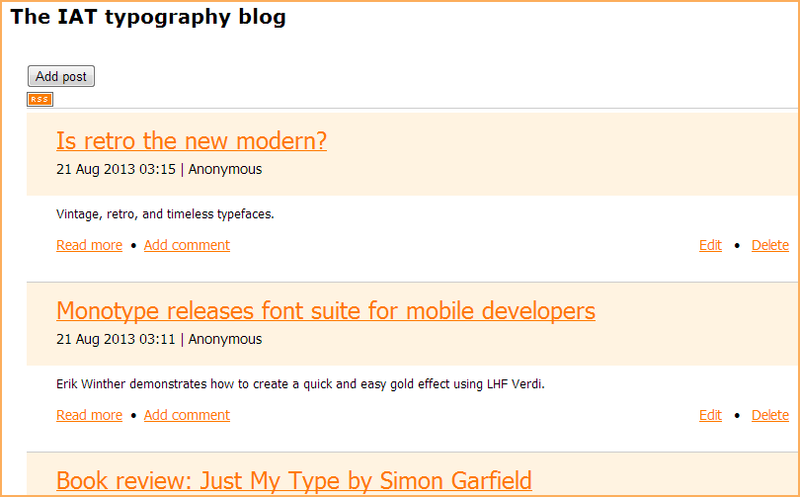 You can change the color and font of various elements appearing on your blog gadget from the Colors and styles screen. For more advanced fine-tuning, you can use CSS customization and theme overrides. Any changes you make will be applied to other gadgets that use the same settings. You can customize the blog page that appears when visitors create or view blog posts by modifying the Blog post system page. Hover over the Website menu and select the System pages option. Within the system page list, select Blog post. Change the page template from the page settings on the left. Hover over the blue box – the system gadget that displays the actual forum topic – and click the Settings icon to display the settings for the system gadget. Click the Gadget or Layout drop-downs to insert gadgets and layouts above or below the system gadget. When you are finished modifying the blog post system page, click the Save button. Using CSS customizations, you can customize your blog pages and gadgets. To do so, hover over the Website menu and select the CSS option. From the screen that appears, enter or paste the appropriate code for your customization, then click Save to preview your customization within the preview area on the right. When you are finished making your changes, click Cancel to close the screen. Using CSS code, you can remove the author's name from blog posts. These customizations do not remove the name that appears for comments on blog posts. This customization will also remove the author's name from the forum updates gadget for Transparent, Modern, Dark, Clouds, Classic, Basic, Notebook, Nature, Memo, Keynote, Granite, Glass, Business, and Aurora themes. When an administrator with a public profile posts a topic to a blog or forum, their name is followed by an (Administrator) designation. A blog displays a list of blog postings, with a short excerpt or abstract from each post. Who can do what in a blog? Who can do what in a blog depends on whether they are an administrator, a member, or a public visitor (i.e. not logged in as a member). The available functionality is summarized in the table below. To view a complete blog posting, you click either the topic title or the Read more link below the abstract. To display comments on a post, click the Comments link. The options available to you on blogs will depend on whether you are a member, and if so, on your membership level. 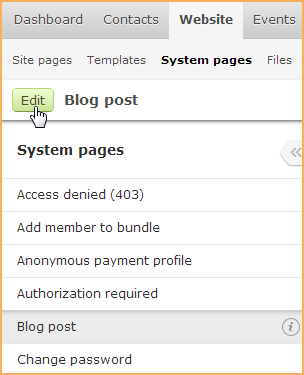 If you are authorized to add a blog post, an Add post button will appear above the topic list. After clicking this button, you can enter the subject and the body of the new topic. 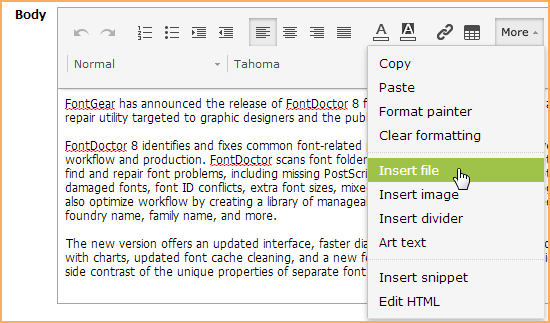 You can use the content editor toolbar to format the body text, and add links and tables. Administrators in admin view can also add pictures, documents, and ArtText, or modify the underlying HTML, using the More menu that appears within the toolbar. You can also set the posting time and date. This does not affect when the post appears on the blog – it will appear as soon as you click the Post button – but only the time and date that appears below the post title. Once you are done composing the topic, click Post. The post will now appear on the main blog page. Normally, the topics you post will identify you using your first and last name. If you chose to hide your profile from others in your privacy settings – or if you are not a member – your posts will identify you as Anonymous. If you restricted access to both your first name and last name in your privacy settings, you will be identified as Anonymous member. The photo of the blog post author cannot currently be displayed. 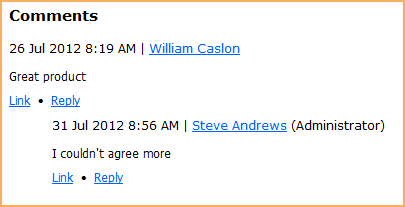 To comment on a blog post, display the topic then click the Add comment button. After clicking this button, you can enter your comment. You can use the edit toolbar to format the text and add pictures, document, or links. Once you are done composing your comment, click Post. To reply to a particular comment, click the Reply link below the comment. Once you are done composing your reply, click Post. Your reply will appear below the comment. 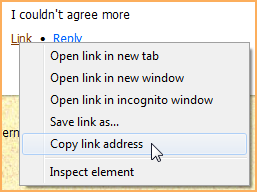 To copy a link to a comment or reply – so you can share it or link to it from another page – right click over Link and copy the address to your clipboard. After you've added a post, you can modify or delete it. To modify a post, click the Edit link below the topic in the blog post list. To delete a blog post, including all comments and replies, click the Delete link below the topic. In public view, you can only modify or delete your own posts. 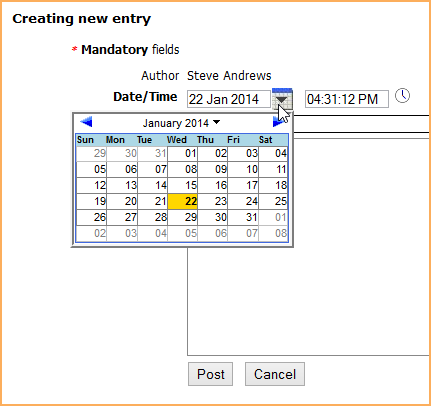 In admin view, an administrator can modify or delete any posts. To modify a blog post in admin view, go to Site pages under Website and click the blog page within the list of site pages. Now, within the blog page appearing on the right, click the Edit button beside the post you want to edit. After you've commented on a post, or replied to a comment, you can delete your comment or reply. To delete a comment or reply, display the comments then click the Delete link. In public view, you can only delete your own comments or replies. In admin view, an administrator can delete any comments or replies. Visitors to your site can subscribe to your blog and automatically receive updates in their RSS reader by clicking the RSS icon that appears beside the page title. You can control whether the RSS icon appears as part of the blog gadget settings. If your blog appears on a restricted page, the RSS feed will not be accessible to your RSS reader.